Happy Gram - Quiltapalooza & Anniversary Sale-abration! 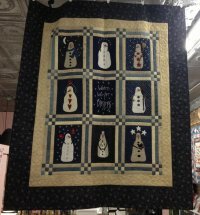 You'll love this adorable snowman quilt appropriately named Warm Winter Blessings. You'll want to snuggle underneath these warm little guys. Each month you'll receive one snowman block and on the 10th month you'll receive the sashing and border fabric. The snowmen are wool on cotton. It has finally arrived! Your chance to see the big reveal and to have first dibs is this Sunday, Dec. 1, beginning at 2 p.m. We had more than 70 people show up for the spring Quiltapalooza, so you'll want to get here on time! Lots of goodies, stories and more. First Sunday Social activities have been cancelled for December due to the postponement of Quiltapalooza. Please bring your blocks to exchange on Sunday and we will exchange them for you while you are participating in Quiltapalooza. We are loving the number seven around the shop this weekend. On Friday and Saturday, Nov. 29 and 30, Happiness Is ... Quilting! will be having its seventh birthday and we are hosting an anniversary celebration. Everyone is invited. Here is how the party is going to work: buy 7 fat quarters, get 7 free; buy 7 yards of fabric (in full yard increments), get 7 yards of fabric free (in full yard increments) from specially marked bolts. 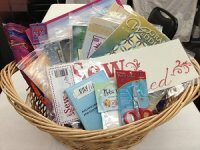 We are also giving away this awesome basket full of goodies on Saturday. Home for the Holidays ... A McKinney Christmas is the best way to start your Christmas celebration. 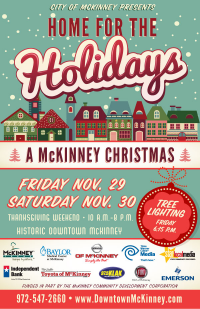 The weekend after Thansgiving in Historic Downtown McKinney features non-stop familly activities, entertainment, food, a chance to finish your Christmas Shopping and much more. Downtown Christmas Tree Light and Candlelight Shopping will take place on Friday at 6 p.m. Candlelight Shopping will end at 8 p.m.